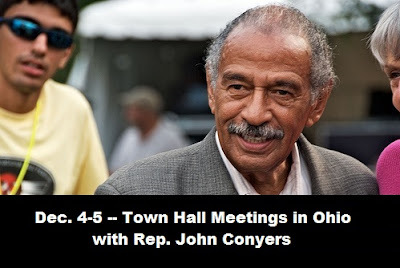 The Town Hall Meetings in Dayton and Columbus featuring Rep. John Conyers went extremely well with good turnouts in both cities. The speeches were informative and the dialogue during questions and answers was positive and highlighted the economic hardship and inequality facing the American people both locally and nationally. The Town Hall meetings succeeded in raising the prominence of the need for jobs, health care, raising the minimum wage, and other key issues. Rep. Conyers has initiated two pieces of legislation that would go a long way toward reducing these problems: HR 1000, the “Humphrey Hawkins Full Employment and Training Act” and HR 676, The Expanded And Improved Medicare For All Act. Prof. Philip Harvey spoke at both Town Meetings, explaining how this legislation would work and what it would do for the unemployed and the nation. Two great teams worked independently on the Town Meetings but with shared agendas. As principal organizer of these events, NJFAC Outreach Coordinator Logan Martinez thanks everyone involved in both Town Hall meetings; the volunteers who put many hours of time in organizing and publicizing, the great co-sponsors in Dayton and Columbus, the financial supporters who made it possible, and the great speakers and panelists. And thanks to Rep. John Conyers for his continuing leadership in the fight for jobs, health care, and a better America. NJFAC looks forward to building an ongoing network for jobs, health care and social justice in Ohio and to mounting comparable Town Meetings around the nation. 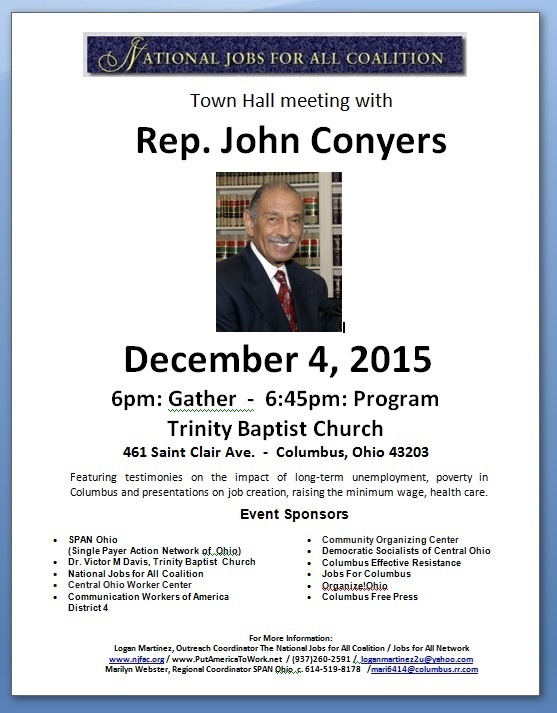 Mayor Nan Whaley and the Dayton City Commission have declared Saturday December 5, 2015 John Conyers Day in Dayton. Keynote, U.S. Congressman John Conyers Jr. 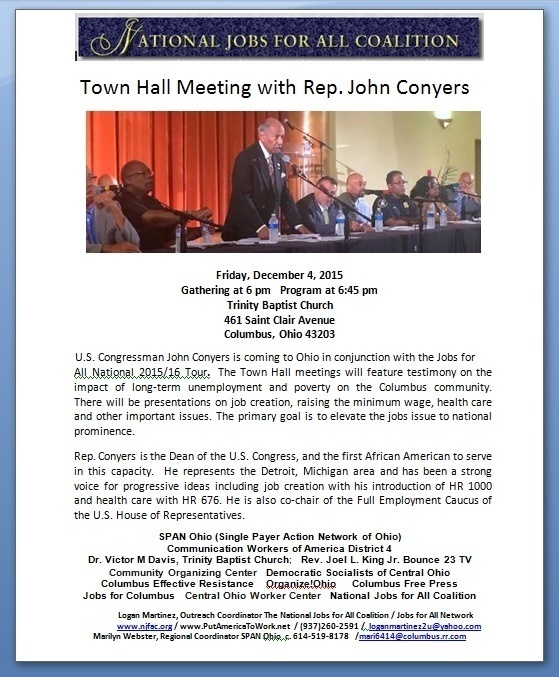 Thanks to Trudy Goldberg, Chair and to the other members of the Board of the National Jobs for All Coalition and to the Jobs for All Network for their support in this effort; and to Erik Sperling, Legislative Assistant to Rep. John Conyers Jr., and Maria D.Reddick, Scheduler for to Rep. John Conyers Jr.
Special Thanks to the Dayton Team: Mary Sue Gmeiner, Deborah Ferguson, Renee Shephard, Tim Bruce, Rev. Robert E. Jones, and Chuck Morton. And Carla Pitsinger, Carole Grimes, Adbullah Shakir, Tiki Kai-Krismano, Gwen Woodall Given and Michelle Jone, and John Bennett, Director of Communications and Public Relations Community Action Partnership of the Greater Dayton Area. Special Thanks to the Columbus Team: Marilyn Webster, Connie Hammond, Elicia Finnell, Debbie Silverstein, Rev. Joel King, Rev. Thomas Toney, Ruben Castilla Herrera, Mark Stansberry, Kurt Bateman and Terrence Gilchrist. Thanks to: Dr. Victor M. Davis, Pastor, Trinity Baptist Church, Brian Coston, Media Ministry, Trinity Baptist Church, Stan Cartwright, Facilities Administrator, Trinity Baptist Church, Hostess Ministry, Trinity Baptist Church, Gabrielle P. Moore and Ron McGuire with Representative U.S. Congresswoman Joyce Beatty, Diane Bailey, Communication Workers of America, Bob Fitrakis and Suzanne Patzer of the Columbus Free Press. A new local coalition of jobs advocates, unions and clergy members will host a congressman from Detroit who is the sponsor of bills to create jobs and provide universal health care. The group will hold a town-hall meeting with U.S. Rep John Conyers on Dec. 4 at Trinity Baptist Church on the Near East Side as part of a National Jobs for All Coalition tour. 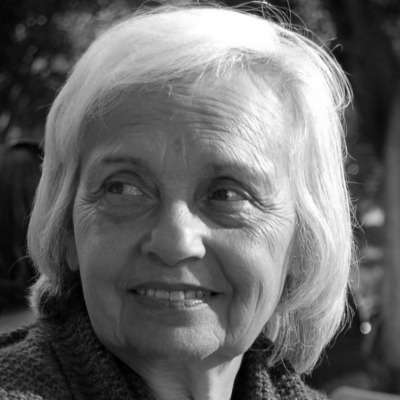 The event will include testimony on long-term unemployment and a discussion panel. Among the group’s goals is raising awareness about unemployment and under-employment among African-Americans, Hispanics and youth in Columbus, said the Rev. Joel King, vice president of the Ohio Interdenominational Ministers Alliance, which represents about 60 clergy members. Beyond that, he said, he hopes residents will be encouraged to get involved in the issue, by asking elected officials to support Conyers’ bills. “We feel like millions of people are being left behind in the American dream,” said Logan Martinez, Jobs for All outreach coordinator. “They’re working extremely hard and unable to make ends meet or working hard and there are holes in the safety net. Conyers’ jobs bill, introduced by the Democrat in February, would create a tax on certain financial transactions, to fund workforce-investment programs and to make job-creation grants to states, local governments, schools, nonprofit organizations and Indian tribes. It is referred to as the Humphrey-Hawkins 21st Century Full Employment and Training Act. The health-care bill, referred to as the Expanded & Improved Medicare for All Act, also was introduced in February and would establish a single-payer health-care system to provide free necessary health care to everyone living in the United States. Both bills had died in previous congressional sessions before being reintroduced this year. 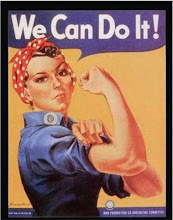 The U.S. unemployment level of 5 percent represents nearly 8 million Americans. On top of that, millions more work only part time or have given up looking for jobs, Martinez said. In Columbus, pockets of the city suffer significantly higher unemployment. According to 2009-2013 Census Bureau data analyzed by the nonprofit Community Research Partners, that was true in 17 of the city’s 28 ZIP codes, with Franklinton at the top with a 29 percent unemployment rate. The poverty rate is at least 26 percent in 15 of the city’s ZIP codes, with Weinland Park at the top with a poverty rate of nearly 60 percent. About a dozen groups have signed on to support the town-hall event, Martinez said. Among them is Jobs for Columbus, an initiative aimed at increasing the city income tax to provide local transitional jobs. The proposal would increase the city income tax by half a percentage point, in an attempt to raise $120 million annually dedicated to job training and creation, said Elicia Finnell, founder of the initiative. She said the money would pay minimum wage for thousands of Columbus residents hired by participating businesses and other locations. In return, employers would provide job experience and training in marketable skills. “It would be sort of a job safety net, that anyone who needed immediate employment could get one of these jobs — sort of a survival job,” Finnell said. The program, she said, could help the homeless, the chronically unemployed, people with criminal records, unemployed youth and unemployed men with child-support obligations. A goal is to place the initiative before voters in November 2016, Finnell said, but efforts are in the early stages. The campaign is creating a petition that it hopes to circulate to gain the signatures needed to get a shot at the ballot.